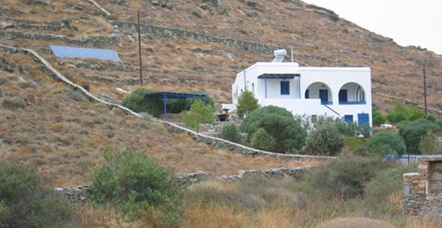 The pilot Microgrid electrifies and isolated settlement of 12 houses in a small valley of Kythnos, an island in the Aegean Sea, Greece. The generation system comprises of 10 kW of solar panels, a battery bank of nominal capacity of 53kWh and a 5kW diesel genset. The aim of the system is to supply 100% solar energy produced by the PVs or stored in the batteries, i.e. the diesel genset is intended only as a back-up unit, in case of prolonged cloud cover or in a case of emergency. A second PV array of 2kW, is mounted on the roof of the control system building (System House). This is a house of about 30 m2 surface area built in the middle of the settlement in order to house the battery inverters, the battery banks, the diesel genset and its oil tank, the computer equipment for monitoring and the communication hardware, called “System Hut or house”. The 2 kW PV is connected to an SMA inverter and along with a 32-kWh battery bank they provide power for monitoring and communication. 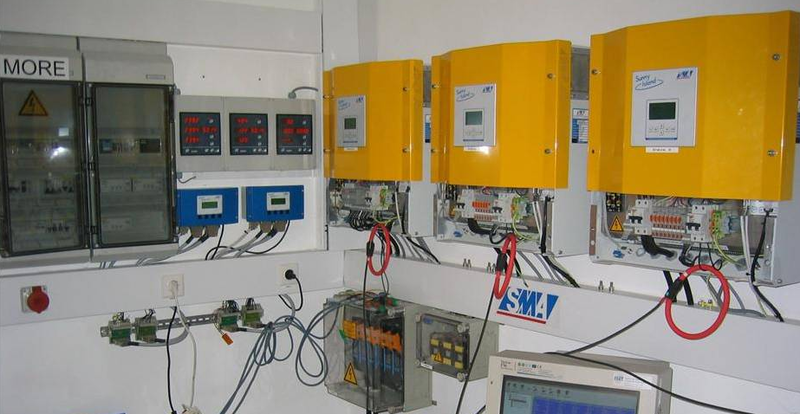 Residential services are powered by three Sunny-island battery inverters, connected in a parallel master-slave configuration, forming one strong single-phase circuit. This allows the use of more than one battery inverter only when more power is demanded by the consumers. Each battery inverter has a maximum power output of 3.6kW. The battery inverters in the Kythnos system have the capability to operate in both isochronous or droop mode. The operation in frequency droop mode gives the possibility to pass information on to switching load controllers in case the battery state of charge is low and also to limit the power output of the PV inverters when the battery bank is full. Each house in the Kythnos Microgrid is equipped with a water pump (1-2 kW), which is used to supply water to the residents of the house. The water pump is typically the largest load in a house and is considered as non-critical. Therefore, in case of energy shortage, it should be disconnected if needed. Experiments on decentralized control of non-critical loads have been performed within the More Microgrids project. 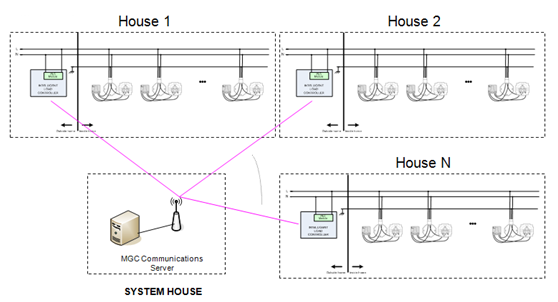 Intelligent Load Controllers (ILC) have been installed in each house. The controller measures electrical values such as Voltage, Current and Frequency measurements and can remotely control up to 256 PLC Switches (Power Line Communication load switches) connected at any place inside the house. Each ILC controls two PLC switches. The first PLC Switch controls the water pump, while the second PLC Switch controls a power socket and any load connected to it (e.g. air-conditioning unit). Additionally, the ILC features a Wi-Fi interface that enables it to wirelessly connect to a Local Area Network. This eliminates the need of a data-cabling infrastructure and simplifies the installation of the units. 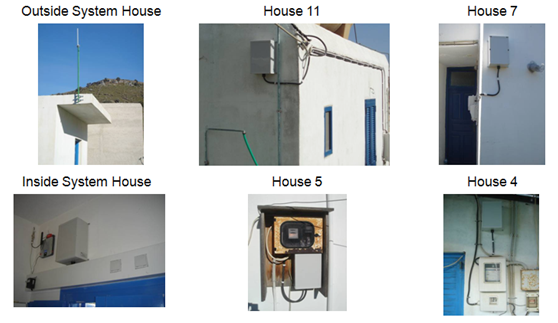 Each ILC unit is connected to the Power Line outside the house, between the energy (kWh) meter and the house’s electrical panel. The PLC switches are installed inside the electrical installation of the household. For the installation of the ILCs, 5 houses were selected plus the System House where the battery inverters (Sunny Islands) are installed. The Kythnos Microgrid is the first actual test site where the MAS system for decentralized control of DER has been implemented. 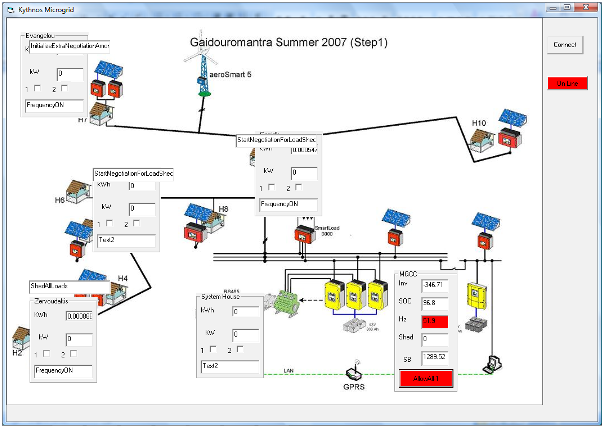 The electric system in Gaidouromantra site was installed in 2001, in the framework of two European projects (PV-MODE, JOR3-CT98-0244 and MORE, JOR3CT98-0215). The complete system costs were supported by the General Directorate XII of the European Commission, which funded 50% of the projects costs, while the rest was funded by national subsidies or by partners’ own contributions according to the status of each partner in the above projects. The main partners in the two initial projects were CRES, SMA and ISET e.V.